Accordion Fold Instructional Insert - Flottman Company. Our customer needed an instruction sheet that would fit well with their packaging but also file easily with other paperwork. Create a miniature folded insert that folds out to an 8.5″ by 11″ sheet. The miniature folded piece fits in well with the product packaging, and is easily filed with other paperwork when unfolded to full size. 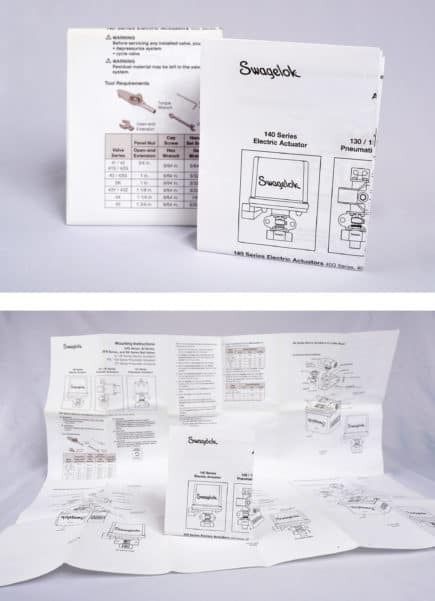 Flottman Company produced a miniature accordion fold instructional insert for a customer’s actuator products. This project’s flat size of 8 1⁄2” x 11” (notebook size) was selected so that these instructions could be filed uniformly with other project materials. The folding of the piece enabled it to be packaged prominently with the product when at its folded size of 2 ⅛” x 2 ¾”. 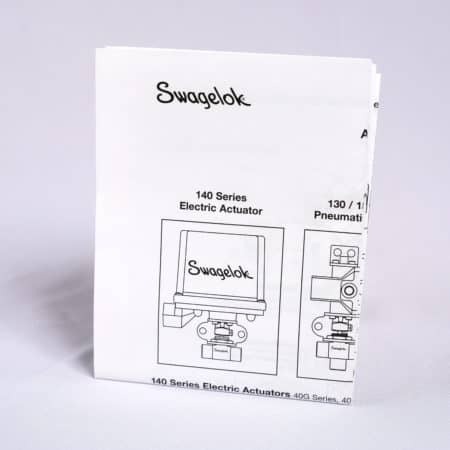 The 24-panel piece includes detailed instructions and information for three different actuators. By using a miniature folded piece, we were able to include all necessary information on an easy-to-read sheet that takes up little room once folded. There is more room for content, meaning the diagrams, charts and text are decently spaced and sized for clear reading and comprehension. This custom product insert has a targeted audience of industrial laborers that work daily with these materials and products, and need information immediately at their disposal. This piece is easily accessible when packaged with the product, as well as when unfolded and filed with other papers. We design, lay out and complete this insert with packaging specifications as our primary guideline. We are able to create a finished piece that fits your needs as well as your specifications. The black and white printing helps to contain costs. The finished insert receives an epoxy seal that streamlines the assembly process, enabling an additional cost saving. Moving this customer’s entire product line to Flottman folded inserts has saved them assembly time and money. Could your products benefit from the inclusion of instructional inserts? Request a quote today!